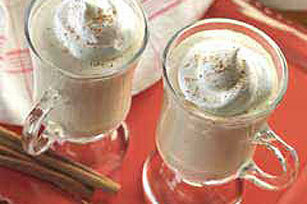 Make one cool and creamy beverage with our Creamy Coffee Eggnog Recipe. A blend of coffee and eggnog is kissed with whipped topping and nutmeg, creating the perfect eggnog recipe. Mix coffee and eggnog in glass or plastic pitcher. Serve topped with COOL WHIP and nutmeg. When serving adults, stir in 1/2 cup rum before refrigerating, if desired.